Early exposure to the arts is key, researchers say — and may be especially crucial for children with the greatest needs — because students’ participation has been associated with higher achievement. This latest Pre-to-3 column focuses on what researchers are learning about young children's participation in arts instruction. Past installments of Pre-to-3 can be found here. While art, music and drama are part of many early-childhood education programs, researchers — and educators — still have a lot of questions about how these experiences benefit children in the early grades and as they continue through school. Such questions have grown even more relevant for school and district leaders since passage of the Every Student Succeeds Act, which provides multiple opportunities for the arts to be part of a “well-rounded” education. A special section of the most recent Early Childhood Research Quarterly (ECRQ) provides some answers. For example, one study focuses on preschoolers who attended an arts-themed Head Start program at the Settlement Music School in Philadelphia. Children in the program participate in daily music, dance and visual arts instruction in addition to being in classrooms using the Creative Curriculum program. The researchers, led by psychology professor Eleanor Brown of West Chester University in Pennsylvania, used a common early-childhood assessment to measure understanding of basic concepts related to school readiness — such as quantity, direction and position, shapes, colors and self-awareness — in a sample of 197 children. Then they compared the findings to the same assessment data collected from a sample of 68 children at another Head Start program that also used Creative Curriculum, but didn’t include daily arts integration. Both programs were nationally accredited and earned the highest ratings in Pennsylvania’s Keystone STARS quality rating scale, but children in the arts-themed program made greater gains in school readiness than those in the comparison program. “The study suggests the arts can serve as a mechanism for promoting school readiness skills,” Brown said last week during a webinar hosted by the National Endowment for the Arts (NEA) Office of Research and Analysis. The research builds on Brown’s earlier work, funded by an NEA Art Works grant, showing how the arts in early childhood can particularly benefit children living in poverty, who face challenges such as high mobility, neighborhood violence and other risk factors. Again, comparing a sample of children in the Settlement Music School’s Head Start program to those attending another Head Start center, she found that those who had daily arts classes had lower levels of the stress hormone cortisol. And on days with more arts classes, their cortisol levels were even lower. Researchers have found that prolonged periods of stress can interfere with a young child’s healthy development and lead to later health problems. Brown added that while “most Head Start preschools don’t have resources” for the kind of arts experiences provided at the music school, she said that there are “scalable models” such as teacher training and artist-in-residence programs. Early Years Educators at Play, an Arizona program that trains teachers to integrate drama into early literacy instruction, is one example of how to increase young children's exposure to the arts. Early exposure to the arts is important, researchers say — and may be especially important for children with the greatest needs — because students’ participation has been associated with higher achievement in school. Students with stronger early academic skills at age 4 and in 5th grade, however, are more likely to “self-select” into arts programs in middle school, Adam Winsler of George Mason University, also a co-guest editor of the special ECRQ section, explained during the webinar. Using data from the Miami School Readiness Project, a sample of over 30,000 children starting at age 4 and continuing through middle school, he has found that students who don’t choose arts electives tend to be black students, males, children with disabilities, English learners and those who were previously retained. One of the challenges related to researching the effects of arts programs on arts skills themselves, as well as on other academic outcomes, is that random assignment is so difficult. But when the Crystal Bridges Museum of American Art opened in a relatively rural area of Arkansas, Brian Kisida, a professor in the School of Public Affairs at the University of Missouri, saw an opportunity to conduct a randomized control trial on children’s interest in art. “Most students in the area had never been to an art museum,” he said. His study focused on a sample of over 38,000 K-12 school groups, organized into an experimental group that won a lottery to receive field trips to the museum and a control group that did not. Among students in K-2, he saw increases in positive attitudes toward the arts among those who went on the field trips. Another recent study, while focusing on older students, also found increases in standardized test scores among students who participated in multiple field trips to Atlanta’s Woodruff Arts Center, which includes an art museum, the Atlanta Symphony and a theater company. Kisida, however, also noted in his comments that either because of budget cuts or pressures to focus on testing, the likelihood that students are taking arts-related field trips has declined, particularly among non-white and low-income students. In his comments, Winsler noted that another challenge for arts educators and researchers is that there is a lack of strong assessments to measure children’s engagement in the arts and the effects of instruction. In her presentation, Amy Susman-Stillman, co-director of the Center for Early Education and Development at the University of Minnesota, described a Preschool Theatre Arts Rubric that she designed in collaboration with the Early Bridges early literacy program at the Children’s Theatre Company in Minneapolis. The program uses storytelling and creative drama to support school readiness skills. “We needed a measure that captured what this program was trying to achieve,” Susman-Stillman said. Her study found that the instrument was a valid and reliable way to measure young children's theater arts skills, such as voice and focus, emotional expression and characterization, and that these skills can also transfer to some "important preschool skills." 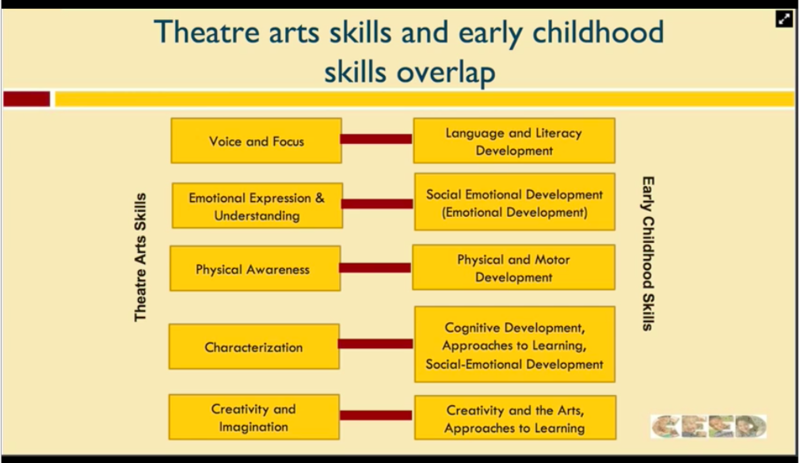 In a presentation, the University of Minnesota's Amy Susman-Stillman showed how "theater arts" skills might connect to school readiness skills. Not all of the papers in the special section find benefits from arts instruction, but that’s also an important contribution to the literature, Winsler said.